We had a good run with The NPR Map but it eventually became too hard to update, reprint, and distribute the map without being physically present in the United States. Thank you to everyone at NPR who helped ensure the map was always up-to-date, who spoke highly of the map, and who helped distribute it through the NPR Shop; thank you Joe, Barbara, Dana and Karyn. Thanks to Martin G, Jonathan, and Dale who performed press checks on behalf of vW Maps. Many thanks to Martin of Bob’s Your Uncle who made the map presentable with a great cover and to Courtney and Michele who made the publication and distribution of the map in the last years possible. Thanks to the FCC for its great database that made the map possible. And of course thank you to everyone who bought, folded, wrote on, framed, or gave away one of the almost 100,000 maps we printed in over a dozen editions! 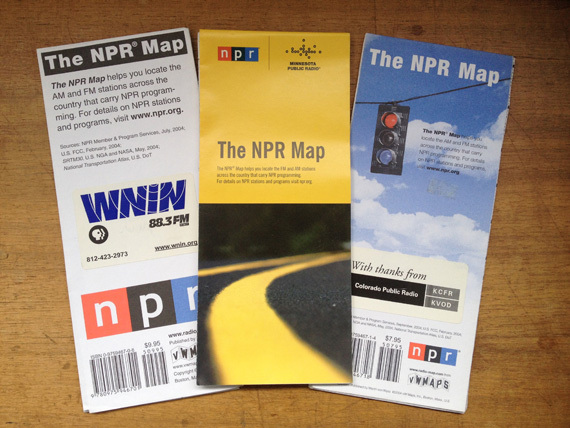 Three covers for The NPR Map.